By-invitation product design contest, reserved to the Dream Team members and to users chosen according to their reputation and activity on Desall.com. 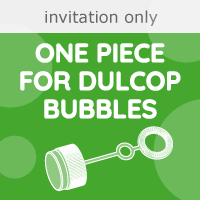 New product design contest on Desall.com: Dulcop and Desall invite you to a new contest dedicated to the design of the new single-component cap for the soap bubble toys, a funny game loved all around the world. If you did not receive the invitation, send your request .